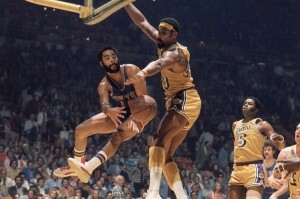 The summer after my rookie year, Wilt Chamberlain, Jerry West, Gail Goodrich, Elgin Baylor, and all of the rest of the 1970 LA Lakers inspired me to transform our driveway basketball hoop into a 60,000 seat arena. Equipped with an active imagination, and hours of solitude, I imagined myself a sharp-shooting, sky-hooking, buzzer beating NBA star. Months later, when the boys of winter reconvened on the hardwood, my hours of driveway-highlight-reel moments paid off. I was assigned the role of point guard, and given a brand new jersey with a real live prime number embroidered on it. By the end of the regular season, we had earned ourselves a spot in the playoffs. Getting through the first round of our bracket involved making it past the high-octane, run-and-gun, Trinity Lutheran team. Just before that game, my dad showed me a defensive maneuver designed to single-handedly shut down a fast breaking team. It worked. Instead of celebrating and carrying the momentum of our last game into the next, dad’s intervention resulted in the unintended consequence of a burdensome self-consciousness. Rather than getting into the flow of the game, I caught myself wondering how I was appearing to the people in the stands. With my attention firmly focused on how I appeared to others, rather than on my love for the game, I made mistakes I hadn’t made since my rookie year. This year, as Palm Sunday rolls around, Christianity focuses upon a peculiar brand of March Madness. There is a phrase used by sports commentators to praise the effort of a hardworking, passionate basketball player, “He left it all out there on the hardwood.” Anyone who stumbled upon the Palm Sunday story, would have to acknowledge that Jesus left it all out there on the hardwood. Palm Sunday is a feast that confronts us with the fickle dimensions of human nature. The palm frond placed into the hands of believers to help celebrate Jesus’ victory lap into Jerusalem, quickly transforms into the Good Friday lash as the congregation shouts, “Crucify him!” “Crucify him!” during the Gospel proclamation. As I walked alongside Jesus through the verses of this year’s Palm Sunday Gospel, I was struck by how resolutely he was able to keep his focus. It didn’t seem to matter where the shifting winds of public approval were blowing. Jesus kept his gaze focused, not on other’s appraisal of him, but on his own mission. A humble, but nonetheless profound insight from this week’s scripture has to do with where we place our gaze. To do anything of any value, even to win a sixth grade basketball tournament, we must resolutely refuse to look at ourselves through other people’s eyes. Any time we spend wondering how we appear to others is a diversion from living out our calling. The question is, how do we develop this skill? How do we silence those inner voices, who like my sixth grade dad, bid us to examine how others are either fairly or unfairly viewing us? Like a little boy watching and then practicing to become like his basketball heroes, the church asks us to immerse ourselves in Christ during the sacred liturgies of Holy Week. By prayerfully identifying with him during the sacred events of this week, we are to absorb something of his passion, something of his personhood, and bring it back onto the hardwood of our own life experience. Before and after the great events of his life, Jesus would escape to a lonely place for alone time with Who and what grounded him. . There he found intimacy, there he reconnected with his mission, there he found a resolve to carry things through to their completion. Prayer is like a good workout. Anytime we give ourselves to God in prayer, we strengthen those muscles that are able to withstand other’s positive or negative opinion. In prayer, we get our gaze off of ourselves and back onto what matters…love of this game we’ve been invited to play with our whole hearts.